Worship in the Church Regular worship in Church is central to the Christian faith and St. Peter’s Church has a wide range of regular services for the local community both on Sundays and other days of the week. Clipping the Church The annual Church Clipping is a unique event which takes place in early July along with our St. Peter’s patronal festival. It is something for the whole community and the Church is keeping up a village tradition. The congregation at the service circles the outside of the Church while holding hands. If the Church is successfully encircled it is said in folklore that the village will enjoy good fortune for the coming year. Annual Church Meeting In April each year an annual meeting is held in St. Peter’s school to which all members of the parish are welcome to express their views. Churchwardens are elected at the Annual Meeting. Parochial Church Council (PCC). The PCC meets quarterly. It is responsible for the financial affairs of the Church and the care and maintenance of the fabric. It also recommends forms of service used by the church and may make representations to the bishop and deanery synod on items affecting the welfare and pastoral care of the parish. Parish post-holders such as the Treasurer, Secretary and Sides-persons are appointed by the PCC. Bible Reading On Sunday morning at the 10.30 am service, members of the congregation read from the bible – the Old Testament, Epistles and the Gospels. Reading practices are arranged to help expression, projection of the voice, and coping with the microphone and sound system. Prayer Group A group meets regularly for prayer. Emmaus Group Jesus appeared before two of his followers in Emmaus after his resurrection. The Church has an Emmaus group which meet to explore the Christian faith and to consider how to put it into practice. 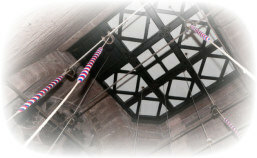 Bellringing St Peter’s Church has a modern, easy going ring of eight bells with the tenor weighing 10 cwt (500kg). We have an active band of ringers which ring for Sunday services, weddings and special occasions, and practises every Wednesday from 7.30 to 9.00pm.Visitors and new recruits are welcome. Children’s Workshop The church holds a number of Children’s Workshops during the year which have proved very successful. Mothers’ Union (MU) The Edgmond Mothers' Union celebrated its centenary in September 2007 and it continues to have a strong membership. A key aspiration of the MU is to support family life and marriages, especially through times of adversity and to bring about a community where God’s love is shown through loving, respectful and flourishing relationships. This is actively pursued through prayer and shared activities. All people are welcome to join the MU. Flower Guild The Flower Guild provides the floral displays and decorates the Church for regular services and special events such as weddings and funerals. Members of the guild are willing to help those who want to improve their skills. Abseiling with the Scouts The Church tower and the surrounding grassy area has recently provided a wonderful basis for young and old to abseil. The oldest abseiler was 89. During the abseiling everyone enjoyed a Church open day with barbecue food and something to drink. Concerts in Church Every year a number of concerts take place in the Church. While some of these include religious music there have also been Gilbert and Sullivan musicals, big band, and choral events.